This 94% acetate and 6% spandex bolero style vintage evening jacket is a Filigree Ltd. Collection. It has a full black 100% polyester lining. There are long sleeves, shoulder pads, and curved front sides. The back is straight across. 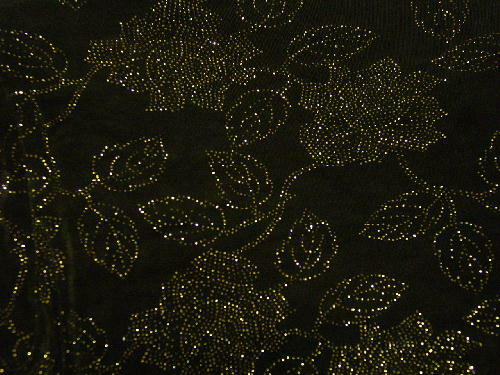 The exterior has a gold glitter fleck, flower, vine, and leaf design. The tag says size 12, but it fits like a size 4. The first time she wore the jacket with the matching dress, she got the dress caught on a nail and ripped it. She wore the jacket to several awards ceremonies and a museum fundraiser. She sold it because it's now too small for her. shoulder to end of sleeve 22 1/2"
shoulder to hem 14 1/4"
bottom hem side to side 16 1/2"